WELLINGTON (Reuters) – Authorities declared an overnight curfew for Saturday after a major earthquake hit New Zealand‘s second biggest city, Christchurch, bringing down power lines and bridges and wrecking roads and building facades. “The damages are incredibly frightening. The only thing you can say it’s a miracle that no one lost their life,” Prime Minister John Key told Television NZ after the quake struck with a magnitude of 7.1 from a depth of 10 kms (6 miles) at around 4.35 a.m. local time (1635 GMT Friday). He said early estimates for the cost of repairs were around NZ$2 billion ($1.4 billion). A curfew was slapped on the central business district of Christchurch between 1900 and 0700 (0700 GMT and 1900 GMT). Earlier, a formal civil defence state of emergency was imposed in the city of around 350,000 to coordinate recovery operations. The last time authorities declared a local emergency was in late December 2007 when a 6.8 magnitude earthquake hit Gisborne on New Zealand’s North Island. The earthquake caused damage to some buildings but also caused no casualties. Christchurch city and the neighbouring small towns bore the full force of the quake, which did considerable damage to infrastructure. “The damage is immense, it’s something that has affected every family, every household…the hit on our infrastructure, the pipes that deliver the water, the waste water, the bridges, the power supplies…has been very significant,” Christchurch mayor Bob Parker told reporters. The city’s hospital said two men had been admitted with serious injuries, one hit by a falling chimney and the other cut by glass. Police said there were minor instances of looting, which had been quickly contained. In the suburbs many houses had broken windows, toppled chimneys, cracked walls and items thrown off shelves, with some streets and footpaths subsiding. In late afternoon, power has been restored to 90 percent of the Christchurch urban area and 80 percent of the rural network. Authorities were preparing to bring in water in large tankers because pumping stations were out of action and pipes broken. The small farming community of Darfield, around 20 kms (12 miles) west of Christchurch, was near the quake’s epicentre. The principal of the primary school there said the quake, which threw him out of bed, was terrifying. “Our china cabinet has crashed, pictures are off the wall, anything high up has come down and the cat has gone. He is probably still heading south,” Markham McCullen told the NZ Press Association. GNS Science, the New Zealand government seismological agency, revised the quake’s magnitude to 7.1 from an original 7.4. The U.S. Geological Survey initially reported it at 7.4 but later revised its figure to 7.0. Christchurch airport, which was shut earlier, has been reopened and is operational, while the railway network and bridges throughout the region were also being checked for damage. Canterbury University, which has about 22,000 students, said there has been no material structural damage on its campus, but the university will be closed until Sept 13 for health and safety assessment. The quake was felt as a long rolling motion lasting up to 40 seconds. The area was continuing to feel aftershocks as strong as magnitude 5.3. The quake was among the 10 strongest recorded in New Zealand, which sits between the Pacific and Indo-Australian tectonic plates, and records around 14,000 earthquakes a year, of which around 20 top magnitude 5.0. The last fatal quake was in 1968 when an earthquake measuring 7.1 killed three people on the South Island‘s West Coast. This entry was posted on September 4, 2010 at 4:37 PM	and is filed under Earth Changes. 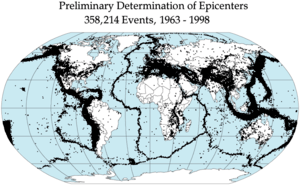 Tagged: Christchurch, earthquakes, New Zealand, Plate tectonics, richter scale, ring of fire, seismic activities, South Island, tectonic shifts. You can follow any responses to this entry through the RSS 2.0 feed. Both comments and pings are currently closed.